Practical, affordable and never careless - the GSP-9300B by GW-Instek. 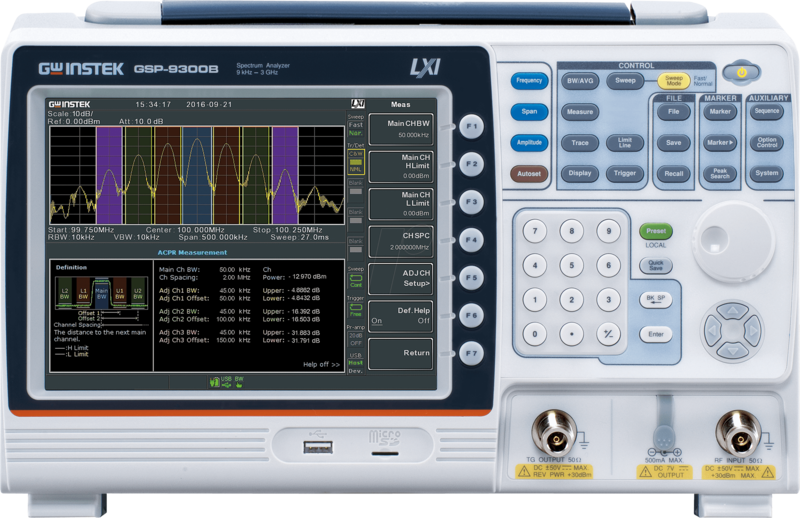 GSP-9300B is a 3 GHz spectrum analyzer to meet basic RF measurement requirements. 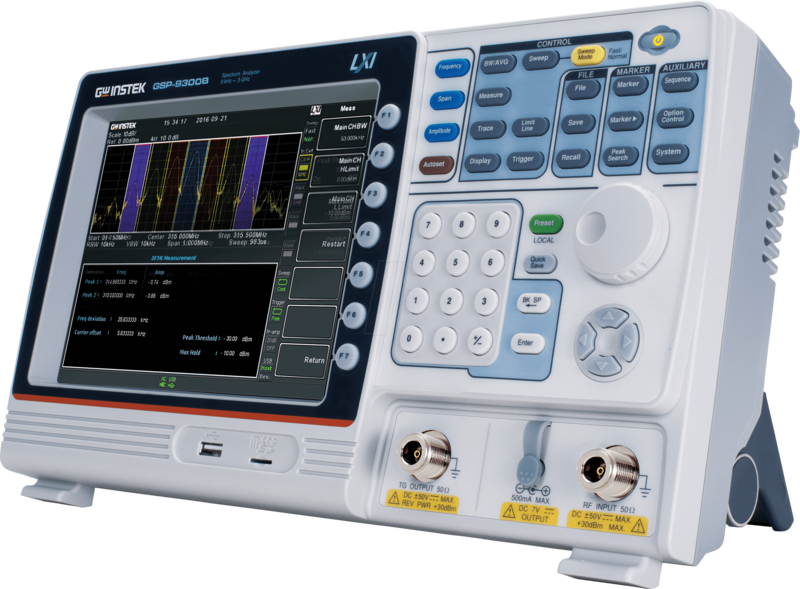 It provides the frequency stability of 0,025 ppm; the aging rate of 1ppm/year; a built-in preamplifier; the base noise of -149 dBm/Hz, and more than 20 measurement applications, including AM/FM modulation signal analysis, signal channel analysis, and CATV parameter test. While collocating with TG option, GSP-9300B can conduct frequency response or power linearity tests for components. For monitoring signals it provides Topographic display mode, which is capable of distinguishing continuous or random signals by using color temperature. Spectrogram mode provides a time axis on spectrum display that allows users to observe signal variations based upon the reference of time. Split window mode allows different parameter settings for each display window. Additionally, this device also provides user-friendly user interfaces such as display mode, help, multi-languages, and fast data logging, etc. 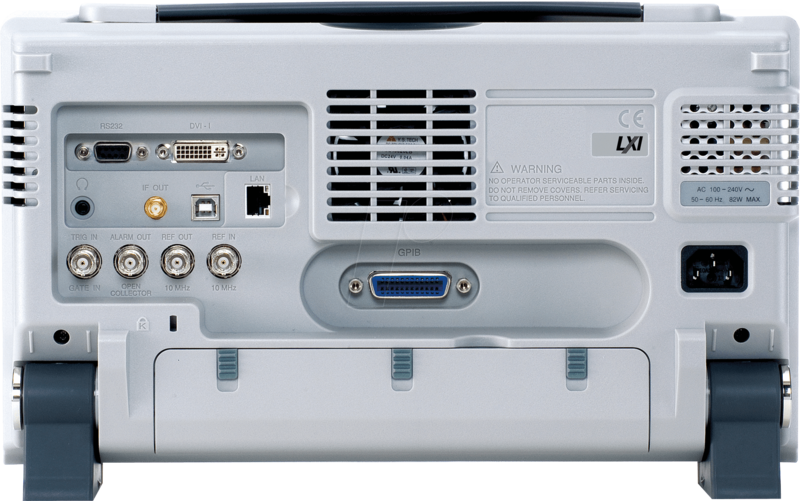 Interfaces and software include USB/RS-232/LXI/MicroSD/GPIB (option)/DVI output and dedicated PC software IVI Driver. 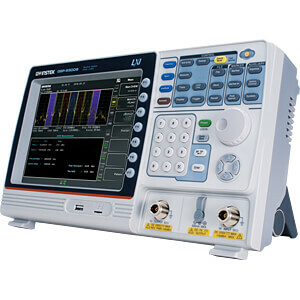 GSP-9300B, with its unique features, including auto wake-Up, sequence function, and limit line testing, is specially designed to meet the requirements of production lines. The patent design of heat conduction allows to substantially reduce the warm-up time so as to expedite production processes. Options include tracking generator, carrying bag, battery module, EMI antenna set and rack accessories. The compact design of GSP-9300B satisfies either field testing or the integration of automatic testing systems. Wireless communications applications are nowadays ubiquitous. Signals in the limited spectrum are getting very crowded. Therefore, the demands of signal efficiency and frequency stability are higher and stricter. To meet high precision measurement requirements, GSP-9300B provides the frequency stability of 0,025 ppm and the aging rate of 1ppm/year, which only appear in high-end T&M equipment. Engineers often face the challenge of measuring small RF signals during product development stage. 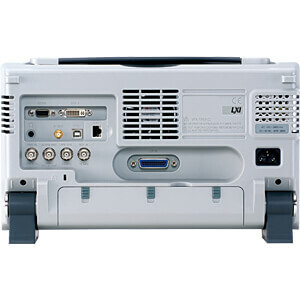 GSP-9300B’s built-in preamplifier provides the base noise of -149 dBm. When collocating with the built-in EMI filter and the dedicated EMI near field probe, it can conduct EMI tests and debugging. 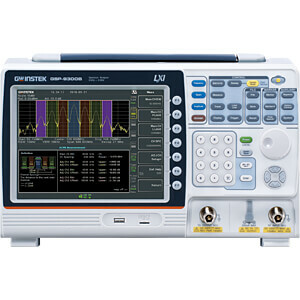 GSP-9300B provides rich signal processing functions, including AM/FM modulation signal analysis, signal channel analysis, and CATV parameter test, characteristic test on signal stability, and frequency response or power linearity tests for components to substantially bring up the measurement convenience.